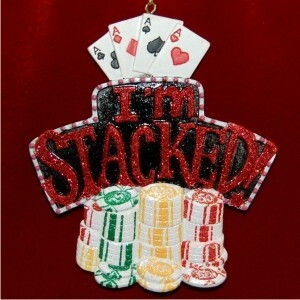 Reading, "I'm Stacked," the chips are stacked Las Vegas personalized Christmas ornament is a fun gift to commemorate a big win at the poker table. We hand letter the information you provide onto the back of these Las Vegas ornament personalized to make them memorable keepsakes. A convenient display cord is attached to the chips are stacked Las Vegas Christmas ornament personalized from Russell Rhodes that arrives in our attractive velvet drawstring bag.